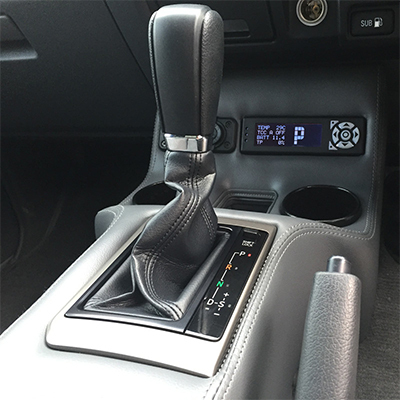 The COMPUSHIFT Sport and Pro are the next generation of automatic transmission controllers. 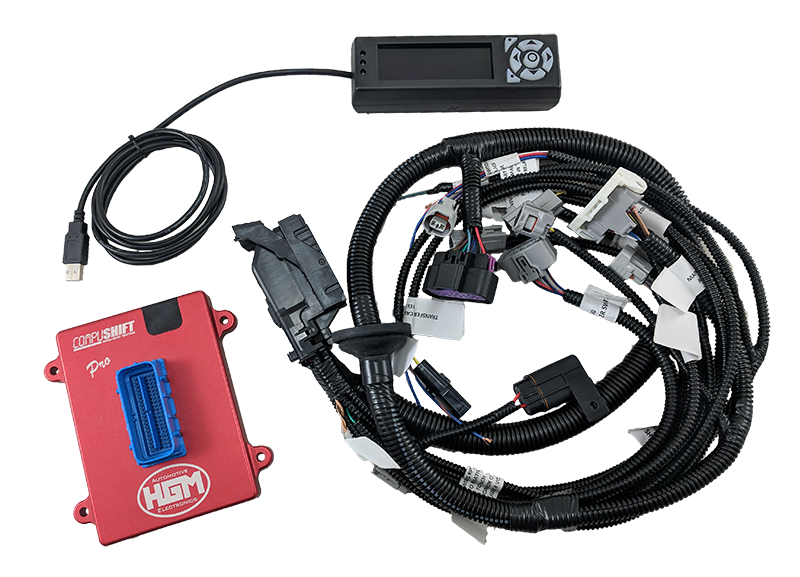 Plugs and Connectors – OEM Connectors are provided with the COMPUSHIFT transmission controller making installation a breeze. Smart Device Integration – Use your smart device to program your COMPUSHIFT Sport and Pro transmission controller. Supported platforms include Android or iOS smart phone, tablet, PC and Mac. 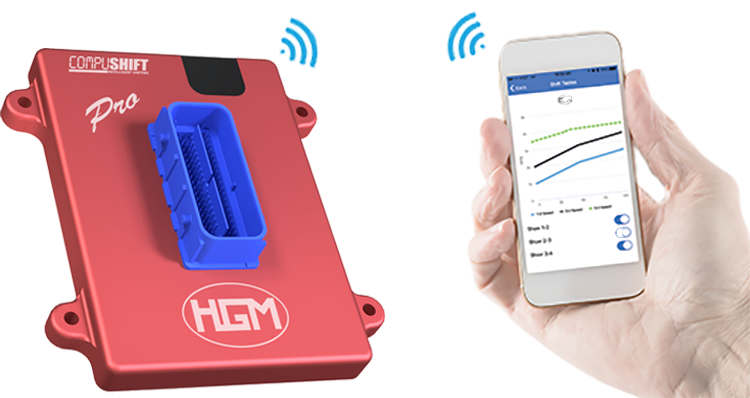 Out of the box integration is included for both Bluetooth and dual independent CANBUS networks. All software is provided. 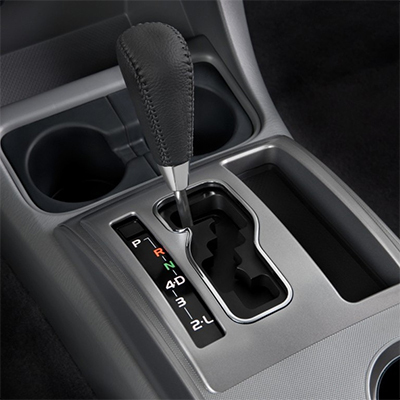 Fully Customize Your Transmission – Get full and precise control of the shifting strategy for your transmission. 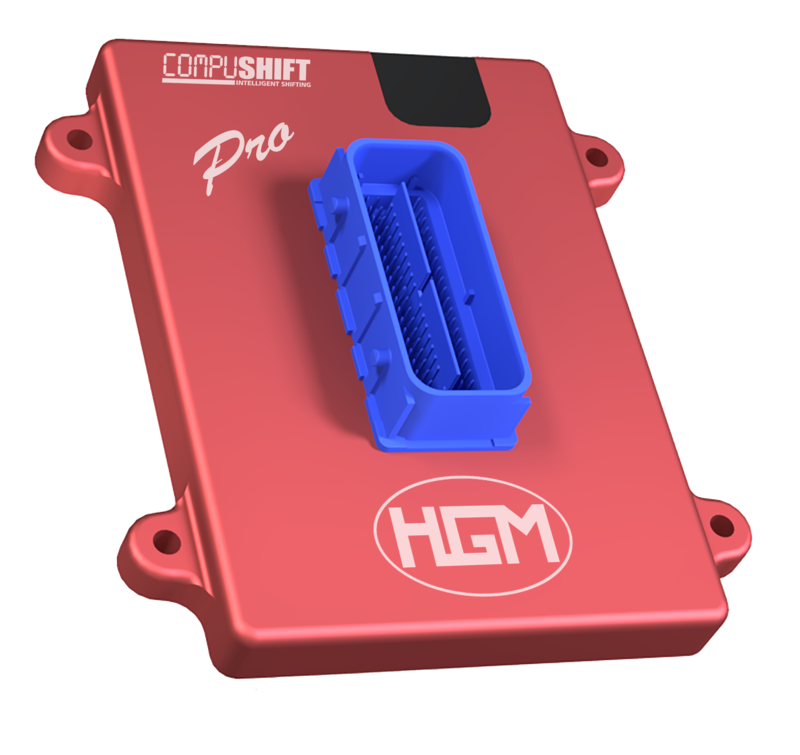 COMPUSHIFT Sport and Pro are delivered with versatile factory-set programming for a wide variety of transmission and engine combinations. 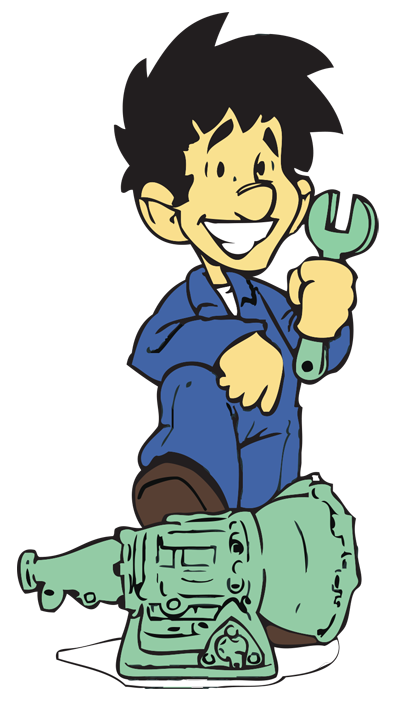 However, you can completely customize settings to your exact specifications. COMPUSHIFT Sport manages 4 speed transmissions. The COMPUSHIFT Sport and Pro are precision engineered, manufactured and tested in America. A carry over of the C6 3 speed transmission, the E4OD and later the 4R100 provided an electronic 4 speed with overdrive transmission. E40D was used primarily in the heavy duty applications such as the Ford Bronco and Ford F-Series. With the 4R100 replacing the E4OD in the late 90’s. The GM 4 Speed transmissions were used primarily in vehicles such as the Holden Commodore and Crewman in Australia, and Chevrolet Impala and Chevrolet Escalade in USA. We can also control the 4L60E Transaxle from the Chevrolet Corvette. The GM 4 Speed transmissions that were used primarily in USA vehicles such as the Hummer H1 and Chevy Silverado/Yukon/Tahoe and is a highly popular transmission for use in conversions especially when using an LS or 6.5 diesel engine. The Nissan RE4 transmission with the larger torque converter, available since 09/1992 in the GQ Patrol, is one of the most mechanically reliable transmissions we have seen and is perfect for a Towing and Touring vehicle. Can be used with the factory T-Bar shifter or any aftermarket shifter that has an overdrive button. The Nissan RE5 transmission is specifically available behind the TB48E in the Nissan Patrol. With an excellent ratio sweep and solid mechanical strength, the RE5 will be a fantastic choice for many doing automatic conversions. The RE5 transmission controller allows full control of the 5 speed transmission using a genuine Nissan TB48 tip-tronic t-bar. The Toyota A340, A341, A343 are a series of automatic transmissions built by Aisin-Warner. The Toyota A442 series of automatic transmissions are one of our most successful transmissions for use with manual to automatic conversions. 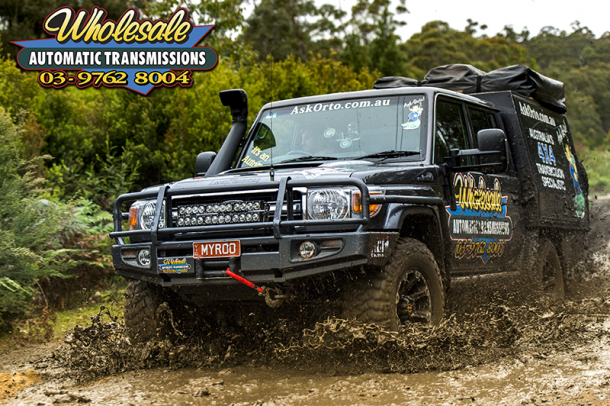 Originally used in the 80 Series Land Cruiser as a part electronic model (pressure controlled from a throttle cable) from 08/1992 until 12/1997. This version then continued onto the 105 Series Land Cruiser behind the 1HZ diesel and 1FZ-FE petrol motors until 07/2007. The 100 Series Land Cruiser started in 1998 with a full electronic version of the A442 behind the 1HD-FTE turbo diesel and 2UZ-FE V8 petrol. The full electronic means there is no throttle cable needed so it is perfect for use behind throttle by wire applications. Both of these transmission versions are controllable by the COMPUSHIFT Transmission Control System. The Toyota A750 automatic transmission is probably the most widely used automatic transmission on the market at present. The A750 is currently available from the factory in 200 Series Land Cruiser Petrol, Prado 150 Series, Hilux, Mitsubishi Pajero and Triton, Suzuki Grand Vitara and Isuzu D-Max. 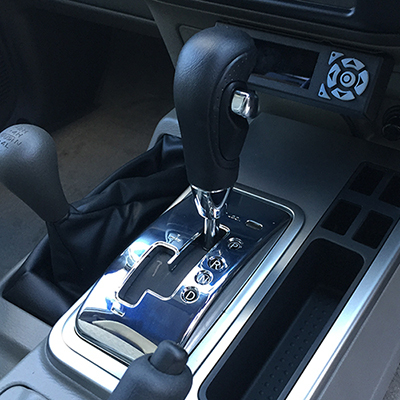 The A750 transmission controller will allow full control of the 5 speed transmission using a genuine gate shift t-bar or genuine tip-tronic t-bar (depending on vehicle). The Toyota AB60 automatic transmission is renowned as one of the strongest light vehicle/SUV transmissions on the market. Designed to be used with a Genuine Toyota Tip Tronic T-Bar, it is the ultimate in automatic transmission conversion systems. Every aspect of the transmission is adjustable including shift speeds, automatic torque converter lockup and kick-down control. The ZF 4HP22 is a four-speed automatic transmission from ZF Friedrichshafen AG for passenger vehicles. Note: There are two variants of the ZF4HP22 with different ratios as above. The Allison 1000 series of automatic transmissions are 5 or 6 speed transmissions used for on-road trucks. They are manufactured by Allison Transmissions in Indianapolis. The Mercedes-Benz 5G-Tronic (also called 722.6) is a 5-speed overdrive automatic transmission that was used in Chrysler Vehicles. In this application it is known as a New Automatic Gearbox Generation One, or NAG1 transmission. The Toyota AA80 / AB80 / AE80 are a family of automatic transmissions built by Aisin-Warner for Toyota. The 6L45 / 6L50 / 6L80 / 6L90 are 6-speed automatic transmissions produced by General Motors. The 6L45 and 6L50 are similar as are the 6L80 and 6L90. Interested? Click here to contact our sales team!